Time flies when you’re having fun! Cliche, but true. Here we are in May and there is no slowing down in sight. This month is a good time to start planning your Outdoor Events and Graduation Parties. Maybe one weekend you decide to throw a party at the park. What goes perfectly with Parks and lots of people? Outdoor Inflatables games and activities, of course! Our Outdoor Water Attractions only come out when the weather is right. We offer several different Wet Inflatables that are great for the long hot summer days and nights. 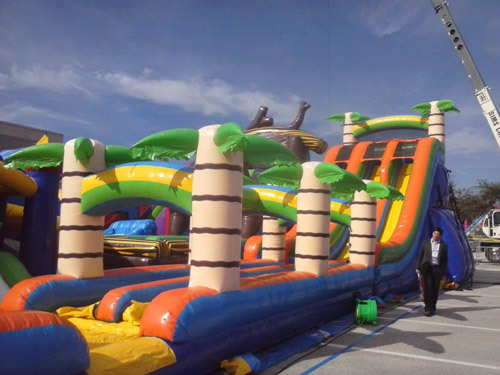 Outdoor Wet Inflatables for Rent – Find more information and prices here. Other fun Outdoor inflatable attraction for groups is the “Volcano Island” Rock Walls. 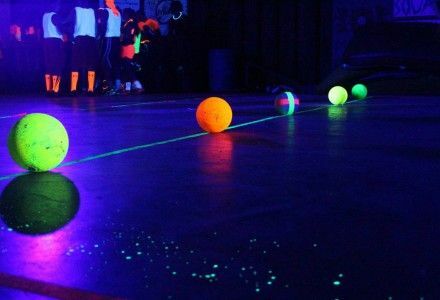 During the night you can have yourself a good old-fashioned Blacklight Dodgeball Game. You provide the room or gym and we’ll provide everything else! Planning a graduation party? We have some fun inflatables that are perfect for those young adults. The Disco Dome is always a hit with millennials. You can provide a DJ or we can provide one of our many Epic Phantom DJ’s. If the Grad’s really wanna get wild, you can rent the Foam Dance Party. The following pictures tell you everything you need to know. Contact Phantom Entertainment today if you have any questions or you want to make rental reservations. Do you enjoy solving mysteries? Is getting out of mazes kind of a hobby to you? We have something unique that will interest anyone who answered yes to both of those questions. Think of the modern day version of Clue, but with different themes. Phantom Entertainment is excited to introduce our NEW Escape Rooms. You and a group of friends (up to 8 people) will work together to solve challenging and unique clues, puzzles, and codes. Escape before time runs out! We have different themed Escape Rooms depending on the vibe of your group and event. These are perfect for Team Building and Company Retreats. These Escape Rooms are not just mechanical puzzles but include electronics and video countdown timers, so expect to feel the pressure. The Abandoned Mansion escape room scenario is exclusive to Phantom Entertainment. Many of the challenges and puzzles cannot be found at any other entertainment company. If you’re concerned about space don’t worry, we have portable indoor versions of the Escape Rooms. All of the challenges, puzzles, and fun are exactly the same. Contact us today to find out upcoming availability on Escape Room Attractions. The Super Bowl is coming up soon. Every year people gather together to throw what they think is an awesome Super Bowl party. We’re not trying to knock the average party, but at DJ Phantom we do parties and events a little different. Think of it like we bring the carnival to you! Here are some epic attractions that will make your Super Bowl party better than anything you’ve ever experienced. Just because there is a football game on, doesn’t mean everything has to stop. For those people who would rather party than sit and watch, our Inflatable Games and Obstacle Courses provide excitement and unintentional competition. 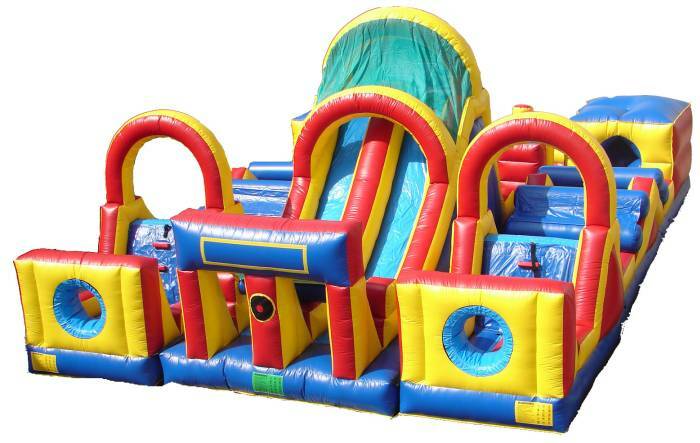 Obstacle courses are a great inflatable party rental. These allow 2 people at a time to race through and challenge each other. Speaking of competition, DJ Phantom has the most competitive games to play while the Super Bowl game is playing in the background. Everyone at the party will forget about the football game when you tell them about the Gladiator Joust. After a few drinks, testosterone runs wild so it’s easy to enjoy yourself with this attraction. Contact DJ Phantom today and reserve your inflatable party rentals before Super Bowl Sunday! If you’re throwing any kind of event with children or young adults soon, you may be thinking of renting a bounce house. Bounce houses are fun. It gives kids an active way to play and enjoy a day together. At Phantom Entertainment, we know that parties are about so much more than bounce houses. While bounce houses often come in a theme, you can build an entire theme party with far more than that. A real amusement an entertainment company has every angle covered from fun foods, to amusement rides to carnival games. The next time you’re ready to plan a party, you need complete entertainment solutions. That’s where Phantom Entertainment comes in. We provide attendants with all of our amusements so that you can focus on the party while we focus on safety. There’s no worry about setup and breakdown because we’ll take care of it. All you need to do is provide us with some outlets and a large enough space for our amusements. Contact Phantom Entertainment and let us help you throw a party that you’ll never forget! This summer, it’s going to be hot. People will appreciate any way that they can cool down. Luckily, Phantom Entertainment has some great options to keep the fun going and cool the temperatures flowing at the same time. From slip n slides to inflatable water slides to wet obstacle courses, our company has a wide variety of wet and cool amusements for you. We even offer a fun, challenging game of water tag! Phantom Entertainment can help you set up the ultimate summer soaker for your organization’s next event. All you need is an outdoor power source and a water source to run any of these amusements and we can easily hook you up to summer fun! These inflatable amusements are fun for all ages. You can easily create a themed party with just a a few different kind of slides or other inflatable water amusements. Mix and match with Phantom Entertainment’s array of choices to create a theme party. Rent our mechanical surf simulator, pirate photo novelties, or a ride-on mechanical shark for the ultimate water-themed event. The best part is that all of our rides and amusements come with attendants. You just have to provide the space and we take care of the rest! Contact PhantomEntertainment today for more information and let us help you start planning the perfect summer event for our organization. Phantom Entertainment is ready for summer, how about you? There’s nothing better than fun activity that also provides some exercise and team building. Paintball is one of those games that does just that. As players run around, they need strategy and camaraderie in order to win the game. PhantomEntertainment has plenty of options available to you for fun, entertainment, and team building. Our portable paintball games are one of those great activities. No matter how big your group is, many different people will be able to play over a 4 hour period of rental. We have special rules for our paintball games that allow you to accommodate your entire group. As you can see, all you need to bring are your players, power outlets, and an outdoor space! When you rent our outdoor paintball set, you may worry about the weather, but don’t fret any longer! If weather doesn’t permit, then we can move the party to an indoor space. We have something available called air bunker ball. This can be used without the arena and still makes use of the same bunkers that are used in paintball. Even if the weather is nice, you can always use air bunker ball in lieu of messier paint balls. Just let us know! Contact Phantom Entertainment today to make your next event super special. We bring all the fun right to you! Our services are great for church groups, schools, summer camps, birthday parties, and more.